Bharatpur Bird Sanctuary - 3 Km. It is famous for rare avian species. Stretching over a 29 sq. km. marshy area it is an ideal terrain for migratory birds. Some 353 species live and breed within the park, some of which are egrets, darters, cormorants, grey herons, sarus crane, siberian crane, rosy headed pelican etc. There are also a number of spotted deer, sambar, nilgai, wild boar, python and porcupine. Jeepable roads that form a network through the marshland and boats that canbe painted through weeds make for easy viewing of the birds. All visitors are required to obtain a permit from the Warden or Ranger at the entrance of the parl. Bharatpur-the eastern gateway to Rajasthan. 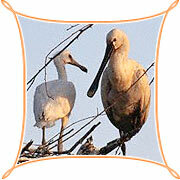 Bharatpur is popular for its bird sanctuary-the Keoladeo Ghana National Park - finest in Asia rich avian variety. Every year the rare Siberian cranes come to spend the winter in the warmer climate of Bharatpur.Of the remnants of the royal past remains the marvellous Bharatpur Palace housing a rich repository of a large number of ancient exhibit that date back to the early 15th century.